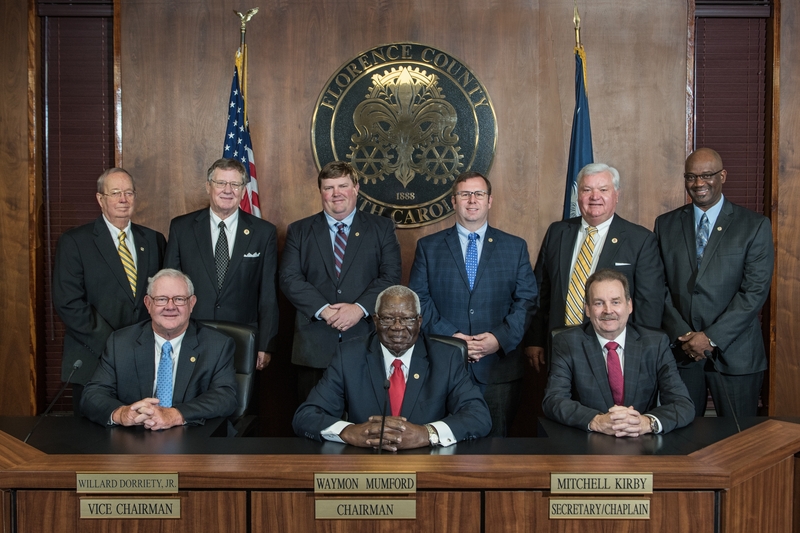 At the January 17, 2019 regular meeting of the Florence County Council, the Honorable Michael G. Nettles, 12th Circuit Court Judge, administered the oath of office to five (5) re-elected members of Council: (from left to right) The Honorable H. Steven DeBerry, IV (District 6), The Honorable James T. Schofield (District 8), The Honorable Jason M. Springs (District 1), The Honorable Waymon Mumford (District 7), and The Honorable Alphonso Bradley (District 3). Also pictured are Senora Mumford (wife of Councilman Waymon Mumford) and LaTonya Bradley (wife of Councilman Alphonso Bradley). In 1888, the South Carolina General Assembly created the “County of Florence”, encompassing the towns of Timmonsville, Coward, and Lake City with the Town of Florence as its county seat. 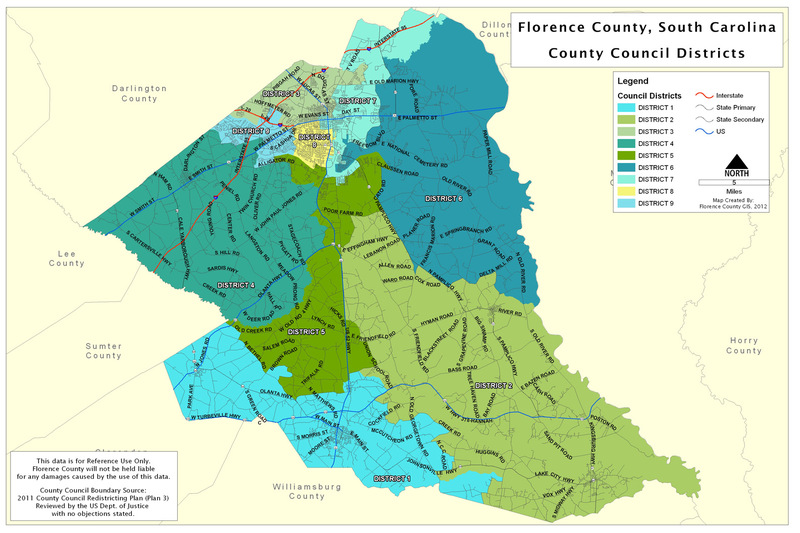 The Florence County Council is composed of nine elected officials, one from each district in the county. Should any person, group, or organization request to be heard upon any matter at a regular or special meeting of Council, such person, group, or organization shall submit a written request to the Chair of County Council to place such matter on the agenda for the meeting at least thirteen (13) days prior to the date set for such meeting. The request shall specifically state the reason for the appearance. In addition, any two (2) members of Council may petition the Chair for persons, groups, or organizations to appear before Council. Any person, group or organization requesting to be heard after an initial appearance on the same issue/topic may appear at the discretion of the Chairman of County Council. Any person, group or organization, when about to speak, shall address himself to the Chair and, in speaking, shall avoid disrespect of the County or any member of the Council or any employee of the County; and shall confine himself to the topic of the request to appear. No matter shall be entered on the agenda or heard by the Council unless it is within the Council’s authority or jurisdiction. Appearances Before Council are limited to three (3) to five (5) minutes. Written requests should be addressed to Connie Y. Haselden, Clerk to County Council, 180 N. Irby St., MSC-G, Florence, SC 29501. The request can also be emailed to Connie or faxed to (843) 665-3042. Florence County Council meetings are broadcast on Time Warner/Spectrum channel 1301 at the following times. Friday Evening (following a Thursday Council meeting) 7:00 P.M.
Monday and Tuesday 9:00 A.M. and 7:00 P.M.